CBN Isn't Satya Harishchandra & Dharma Raju! 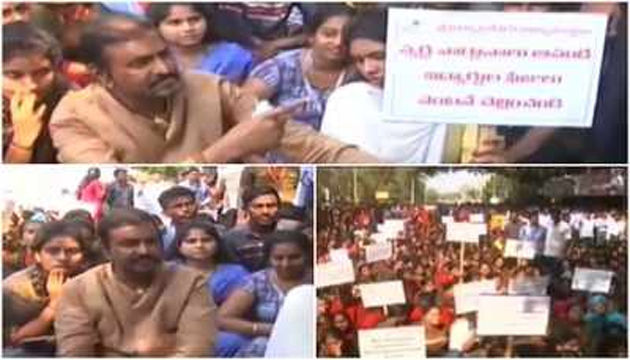 Mohan Babu planned stage dharna from 9 am on Friday in protest against the delay in clearance of Fee Reimbursement dues. He even obtained permission from Tirupati Rural Police Station. Police surrounded the residence of Mohan Babu even before he could reach Sri Vidyaniketan. Manchu Manoj was with Mohan Babu when this incident happened. Police Force has been deployed at Sri Vidyaniketan by 7 am itself. Mohan Babu made many appeals and even written letters to State Government seeking clearance of Rs 19 crore dues. He preferred dharna as a last resort but cops cited Model Code of Conduct to prevent the peaceful protest. Still, Mohan Babu conducted the rally with his two sons and students. When quizzed what kind of indication he wishes to send to CM Chandrababu Naidu by staging the protest, Collection King replied: 'Chandrababu was CM of AP in the past, not now. He is caretaker CM at present. Chandrababu need to stop making false promises at the time of elections. People know what he has done in the past four-and-a-half years. They will teach him a lesson very soon. If we ask why Fee Reimbursement dues weren't settled, CM cites construction of Amaravati as a reason. From where did he get money for Pasupu-Kunkuma Scheme? How did he get funds for other poll sops? Chandrababu Naidu is paying back a part of the looted money. He is neither Satya Harishchandra nor Dharma Raju'. Why Varma Wants To See PK & Paul As CM?